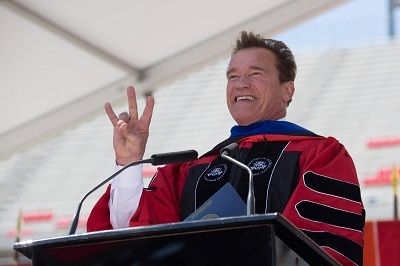 Former California governor and iconic actor and bodybuilder Arnold Schwartzenegger delivered a rousing address to the commencement crowd at TDECU Stadium, reminding graduates that no one can succeed alone, drawing from his own experiences as an immigrant — and weaving in some of his iconic films along the way. “The whole concept of the self-made man or woman is a myth …. I just didn’t materialize like the terminator in a fire ball on the streets of Los Angeles.” Watch the full ceremony for more: the introduction to his speech begins at the 1 hour 18 minute mark. There were two very special graduates walking across the stage during the ceremony: a father (age 86) and son (age 23), both graduating from the College of Liberal Arts and Social Sciences! Margaret Webber (J.D. ’17) wanted to be on campus to receive her degree, but she had a good excuse to miss the event: graduation day fell on the same day that she gave birth to her first child! This makes the day doubly special as she embarks on both her law career and motherhood. 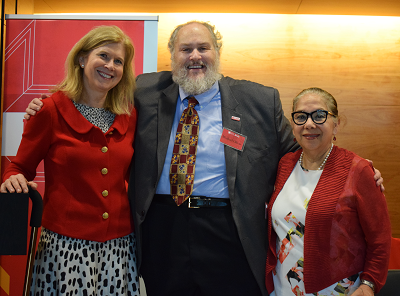 Faculty and staff raised an amazing $1,344,191 for UH priorities during the 2017 Faculty & Staff Campaign! Campaign Co-Chairs and longtime UH professors, Dr. Michael A. Olivas and Dr. Augustina “Tina” Reyes (Ed.D. ’91), revved up the fundraising by pledging to match up to $100,000 in donations. 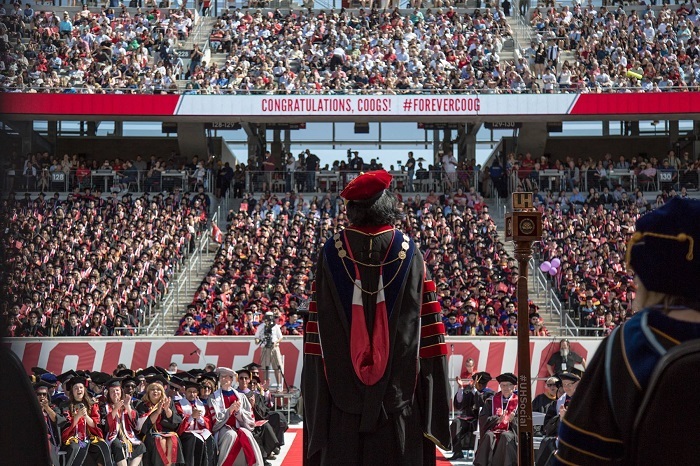 Read more about the Co-Chairs and the Faculty & Staff Campaign — including which UH departments had the highest participation rates — on the “Here, We Go” Campaign website. Have you seen the latest edition of UH Magazine? Read the full issue online, and make sure to check out the story about Lance Funston (’67) on why he continues to give to his alma mater, and the full “Here, We Go” Campaign launch recap. On May 6, the UH Alumni Association held its 63rd annual gala. Honorees included amazing alumni such as Houston mayor Sylvester Turner (’77), Wade Phillips (’70) and Star Jones (J.D. ’86). To see video interviews with the honorees, visit the UH Alumni Association Youtube page. Khanh ‘Kate’ Nguyen, a second-year Ph.D. student in the Department of Mathematics, was awarded a competitive and prestigious National Science Foundation Graduate Research Fellowship. This fellowship, which is open to graduate students in science, technology, engineering and mathematics disciplines, is highly selective, with over 13,000 applications received for 2,000 awards. On May 13, Duy-Loan Le (M.B.A. ’89) became the first engineer inducted into the Asian Hall of Fame, joining a roster that includes Olympic athletes, former White House cabinet members, and Hollywood celebrities. Since arriving in Houston as a 12-year-old who spoke no English, Le has achieved many accomplishments, awards and historical “firsts.” Read the full interview to hear more about her inspiring story! Take a break from “googling” and check this out: from a competitive pool of applicants across the country, two undergraduate students from the C. T. Bauer College of Business have been selected to participate in a summer internship program for Google, the tech giant frequently ranked as one of the world’s best employers. Environmental engineering Ph.D. candidate Aparna Balasubramani is “cleaning the environment and sweeping awards” for her innovative work finding solutions to water pollution. Just down the road at Denver Harbor Family Clinic, a partnership between the UH College of Pharmacy and Vecino Health Centers is providing clinical pharmacy services to the underserved Northeast Houston community, focusing on the prevention and treatment of diabetes. UH students contain multitudes! Ph.D. candidate Zachary Turpin recently discovered a Walt Whitman novel in the Library of Congress that had been lost for 165 years. Because of this discovery, along with his previous Walt Whitman findings, Turpin has been awarded the prestigious Kluge Fellowship to live in Washington D.C. this summer and see what additional Walt Whitman lost works he can find in the Library of Congress. Worried robots will take your job? UH researchers say people who are more intelligent and who showed an interest in the arts and sciences during high school are less likely to fall victim to automation. Anna Zhang, a College of Optometry student, was recently awarded a three-year scholarship via the U.S. Army’s Health Professions Scholarship Program and was commissioned as a Second Lieutenant. Her scholarship covers full tuition and equipment purchases, includes a monthly stipend, and guarantees a position as an Army optometrist upon her graduation. Computer science experts at the University of Houston are “phishing” for reasons why ransomware and malware attacks are so successful. The research findings, presented last month at the ACM Asia Conference on Computer and Communications Security, are being used to develop the next generation of email filters to better identify and defend against this type of cyber attack. College of Liberal Arts and Social Sciences Ph.D. student in history, Daniel Mendiola, was recently awarded a Fulbright Fellowship to spend the 2017-2018 school year in San José, Costa Rica, to conduct research in the country’s national archives. Denise Alonso (’16) is the first assistant manager in the history of the Bayou Club of Houston, and this June, she will celebrate her one-year anniversary. The exclusive club has been in operation since 1938. University of Houston physicists have discovered a catalyst that can split water into hydrogen and oxygen, composed of easily available, low-cost materials and operating far more efficiently than previous catalysts. That would solve one of the primary hurdles remaining in using water to produce hydrogen, one of the most promising sources of clean energy. Have a student or alumni story you’d like to see linked on the round-up, or know a Cougar we should profile in one of our weekly interviews? Contact us at lunarcougar@uh.edu. To read more great alumni and donor profiles, or to make a gift to UH, visit the University Advancement home page.